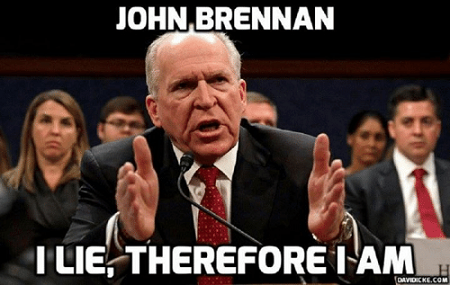 Senate Intelligence Committee Chairman Richard Burr (R-N.C.) on Thursday took aim at Brennan for "purport[ing] to know, as fact, that the Trump campaign colluded with a foreign power." “If his statement is based on intelligence he has seen since leaving office, it constitutes an intelligence breach. If he has some other personal knowledge of or evidence of collusion, it should be disclosed to the special counsel, not The New York Times,” Burr said. The New Fashion of the age, and like dogs, the many have not a clue as to WHY, but only want to please their masters. Perhaps, as these parasites are exposed to day light , they will start turning on each other.........We can only hope. The fact is I can't say I love Trump, I do know I love my Country and the every day citizens that live here and like the way they live and if they don't they still have the right and opportunities to change their own direction if they so choose. The infirm, the old , the druggies and the just plain lazy have the best and the most free stuff of any people in the world! The complainers will have to face their own Karma, so sad ,but it is what they desire. Brennen is coming undone, The Devil, is pissed! In a Sunday interview with NBC's Chuck Todd, Brennan blasted Trump for what he calls an "egregious abuse of power and authority," adding that he's "been contacted by a number of lawyers" who have advised him on legal options - including the possibility of an injunction to stop more clearances from being revoked. Meanwhile, Benghazi survivor and former Army ranger Kris Paronto - who lost his security clearance years ago after telling his account of the Benghazi attack - slammed Brennan in a Thursday tweet which reads: "My principles are greater than clearances too John, especially when you and the @CIA kool-aid drinkers punished us for not going along with the Benghazi cover-up story in order to protect you, @HillaryClinton ‘s & @BarackObama ‘s failures. You put your politics before us."